they were all in one place together. and it filled the entire house in which they were. which parted and came to rest on each one of them. as the Spirit enabled them to proclaim. because each one heard them speaking in his own language. “Are not all these people who are speaking Galileans? Then how does each of us hear them in his native language? Over the past nine days we’ve viewed images of this event as we prayed the Pentecost Novena. Our final image today is from a magnificent carved Altarpiece with paintings attached to its wings that can only be seen when the Altarpiece is opened for display. It’s customary for Catholics to pray a novena to the Holy Spirit for the nine days between the Feast of the Ascension and Pentecost Sunday. 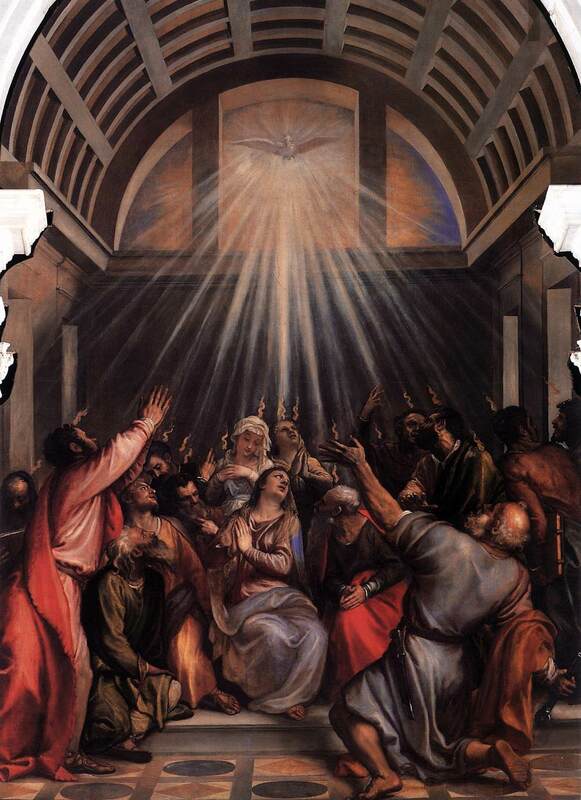 There are many novena prayers to choose from so for this post I selected the Novena to the Holy Spirit for the Seven Gifts accompanied by depictions of Pentecost from art history in chronological order. When the time for Pentecost was fulfilled, they were all in one place together. And suddenly there came from the sky a noise like a strong driving wind, and it filled the entire house in which they were. Then there appeared to them tongues as of fire, which parted and came to rest on each one of them. And they were all filled with the Holy Spirit and began to speak in different tongues, as the Spirit enabled them to proclaim. Holy Spirit window, Bernini, St. Peter’s Basilica, Vatican, Rome. Pentecost, Folio 14v of the Rabbula Gospels, ca 586, 34 x 27 cm, Biblioteca Mediceo Laurenziana, Florence. 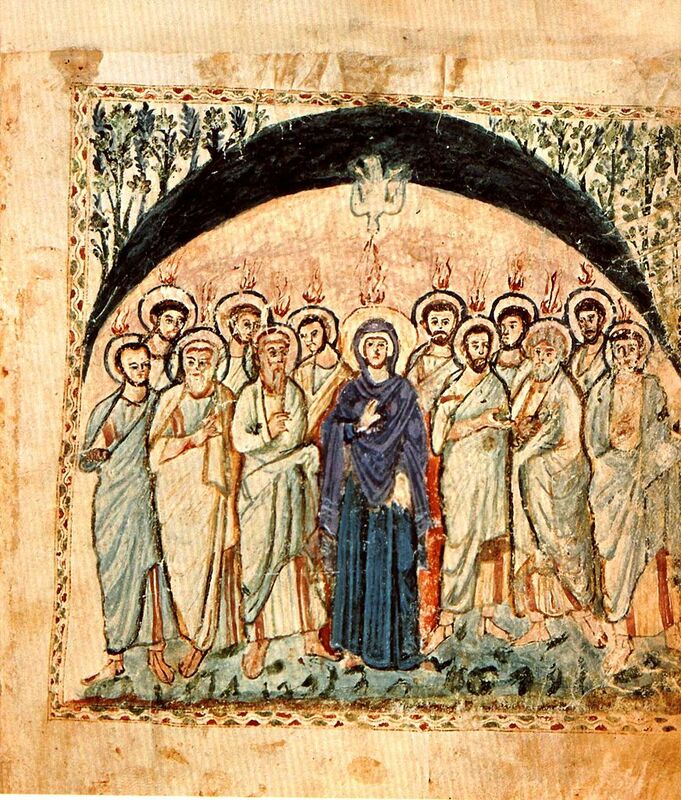 The earliest image that I could find of the Pentecost event is the illustration above (click on it for larger image) from a 6th century illuminated manuscript of the Gospels created in a Syriac monastery and now housed in the Laurentian Library in Florence, Italy. Known as the Rabbula Gospels since it is signed by a scribe of that name, it is one of the earliest illustrated Christian manuscripts. In this depiction of Pentecost, we see Jesus’ mother Mary at the center, dressed in her customary blue and surrounded by a symmetrical arrangement of the twelve apostles. Both Mary’s halo and the areas to her right and left are painted in red, creating a sort of mandorla that sets her apart from the others. The apostles’ halos are a deep bluish black, they are all bearded, and careful attention has been given to the details of their garments. All of the figures hold their right hands in a gesture of blessing or praise while tongues of fire hover above each head. 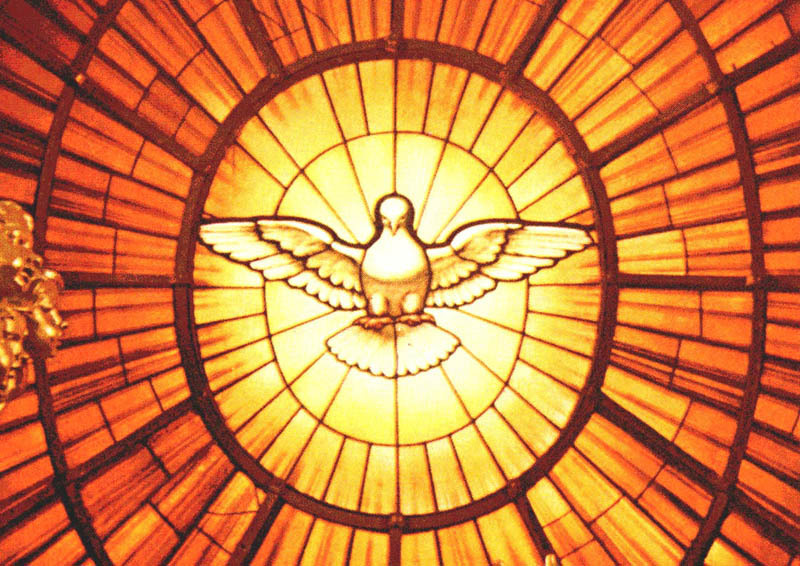 Descending from above we see the dove of the Holy Spirit issuing forth its rays. Curiously, although Luke states in the Book of Acts that they are all together in the house, in this scene they appear to be in a cave. We see them standing on a rough, rocky surface, there are trees above to indicate the outdoors, and the dark semi-circle enclosing them could be the roof of a dark cave, though it may also signify the dome of heaven. The Descent of the Holy Spirit by Titian, 1545, oil on canvas 570 x 260 cm, Santa Maria della Salute, Venice. Our next image of the event is by Titian, the 16th century Venetian Renaissance master who would influence artists for generations to come, including Baroque artists such as Rubens, Rembrandt, and Velazquez. Titian was known as a brilliant colorist, though by the time of this painting his mature style displayed more subdued tones than the vivid hues of his earlier works. The stark difference between this work, painted for the church of Santa Maria della Salute in Venice, and the 6th century manuscript we saw previously, reflects the millennium of artistic development that separates the two images. Though Titian’s painting contains some of the same basic elements as the Rabbula manuscript, the style is now naturalistic, with figures that appear fully fleshed out and rounded, wearing garments that reveal the movement of the bodies beneath them. Two more women behind Mary have been added to the scene. Rather than all the figures standing hieratically in a row, as in the manuscript, we now have figures that are twisting and straining with emotional energy as they gesture and pray while the fire of the Spirit descends upon them. We now also see an architectural setting with depth, as displayed in the coffered vault above the figures that seems to recede into the back wall, where the opening reveals the dove of the Holy Spirit. Pentecost by El Greco (and workshop) ca.1600, oil on canvas 275 cm x 127 cm, Museo Nacional del Prado, Madrid. In his later years Titian experimented slightly with a style from Rome known as Mannerism, which featured distortions of the human figure, bizarre colorations, flattened pictorial space, and an emphasis on sophistication rather than naturalism, but he never really abandoned his Venetian roots. El Greco, on the other hand, embraced Mannerism with a vengeance. Originally from Crete (hence his nickname, meaning “the Greek”) where he painted Eastern Orthodox icons, El Greco then studied painting in Venice and Rome and subsequently achieved success in Toledo, Spain. In this painting of Pentecost, we see all the hallmarks of El Greco’s highly distinctive style. The figures are unnaturally elongated, the colors are sulphurous, the composition is crowded with figures and has virtually no background apart from a few steps at the bottom and the arch above where the Holy Spirit descends. The space is compressed and flattened, which both pushes the figures outward and invites the viewer in. The two figures in the foreground, with their backs to us, seem near enough to touch, and their craning necks twisting upwards give one a slightly vertiginous feeling. Pentecost, Jean II Restout, 1732 oil on canvas 465 x 778 cm, Louvre, Paris. The painter Jean Restout came from a family of artists known for works on religious and historical subjects. He was nearly relegated to obscurity, but recent work by art historians to rehabilitate 18th century French history painters has revived his reputation somewhat, and several of his works are now on display in the Louvre. One reviewer describes his style as idiosyncratic, with animation and exaggerated poses in figures who are caught up in their turbulent drapery. You can see all of these qualities in this enormous rendition of Pentecost. Throne of St. Peter with Holy Spirit window, Bernini, bronze, gilded stucco, marble, stained glass, St. Peter’s Basilica, Vatican, Rome. 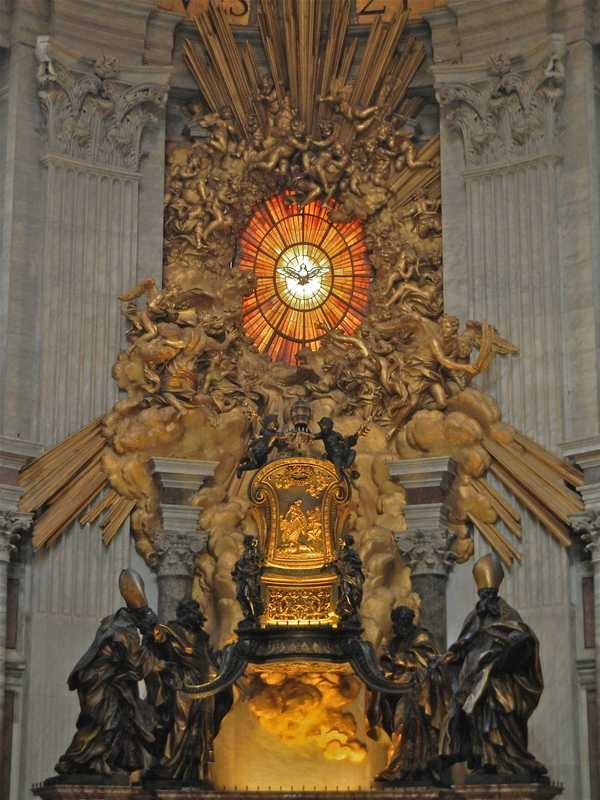 Finally, though not an image of the Pentecost event described in the book of Acts, we have the Throne of St. Peter from the Vatican, another stupendous concoction designed by the Baroque sculptor, Gian Lorenzo Bernini, which includes the dove image of the Holy Spirit. The bronze throne encases a much older wooden chair that tradition says was the actual chair of St. Peter, but that scientific testing and historical scholarship reasonably date to the 10th century. The chair represents the Pope’s office as the Bishop of Rome, the position that was first held by Peter, according to tradition. Bernini’s bronze chair seems to float on clouds and light and is held to earth by four bronze statues of doctors of the Church, Augustine, Ambrose, John Chrysostom and Athanasius. Above the throne, gilded rays, clouds and dancing angels surround the stained glass window with the dove of the Holy Spirit depicted in its center. The whole monument symbolizes that the Church is the completion of the mission of Christ and the Holy Spirit, to bring the faithful to share in communion with the Father. 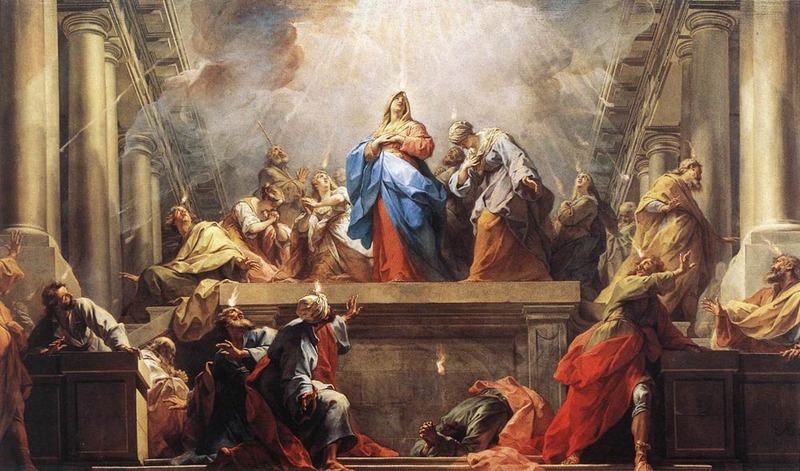 In addition to bestowing the Holy Spirit on those who believe and completing the Holy Trinity, the Pentecost event also signals the foundation of the Church, which is the body of Christ and the temple of the Holy Spirit. At Pentecost the Church celebrates this fulfillment of the Holy Trinity, the event when, “of his fullness, Christ, the Lord, pours out the Spirit in abundance.” By this act, the love of God is poured into our hearts and makes it possible for us to bear the fruits of the Holy Spirit: love, joy, peace, patience, kindness, goodness, faithfulness, gentleness, self-control. For St. Ambrose, the fourth century Church Father, the Holy Spirit was a flowing river that goes forth from the Fount of Life, while St. Augustine proclaimed that there is no gift of God more excellent than the Holy Spirit. Finally, here are two very different videos for the musical contemplation of Pentecost. The first is the Veni Sancte Spiritus, sometimes called the “Golden Sequence,” chanted by the Schola Gregoriana Mediolanensis. The second is the song, Soul on Fire by the popular contemporary Christian musical group Third Day. Enjoy!